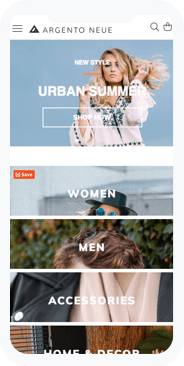 Looking for the best Magento template for your store? Meet Argento - created from the ground up on the best ecommerce stores practices and according to the latest Magento guidelines. We live in a mobile era. Responsive design is indispensable for any modern web-store. Now you can use the Argento responsive theme in order to fit any browser width and screen resolutions. It works great even on small mobile screens and wide desktop screens. Double your chance of success by connecting to customers anywhere and anytime. Magento mobile Argento was specially developed to work on iOS and Android. Stop wasting money to creation of separate mobile stores or using mobile application. Just communicate your purchasing improvement ideas to your mobile customers by using the best Magento template. 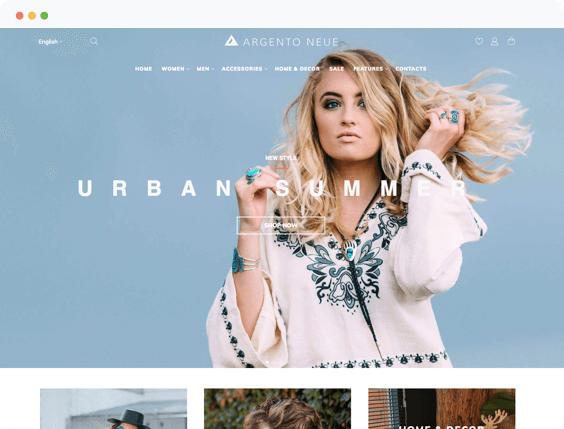 Argento is considered to be the best Magento 2 multipurpose theme. Depending on the products you are selling, you can choose Blank, Essence, Flat, Mall, Pure 2, Luxury or Stripes design. We offer free installation performed by our developers. Now it takes only a few minutes to install Argento theme via composer or by downloading theme package. Just follow simple instructions. No more complicated installation steps. With one click installer, Magento 2 template installation is really easy. 20 essential modules in package. Argento theme is a set of must-have extensions for compelling user experience. The modules enrich template with powerful functionality. They all will help you to deliver the best possible results for your e-commerce needs. Argento designs, as well as modules, drive leads and sales to your website. That all is long term investment for your business. Great customization flexibility. Argento template is a vast array of customizable themes like Luxury, Stripes, Flat, Pure, Essence, Mall. But it also allows you to create a completely new theme designed from scratch. 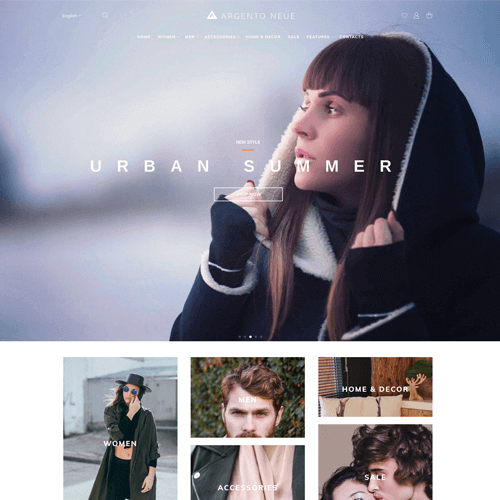 Argento provides highly flexible template system with easy to set up layouts, background, colors, fonts. Using powerful and thoroughly documented admin panel you will easily customize your store frontend to suit your needs. Mobile-friendly. Argento theme is perfect for providing a successful mobile-friendly shopping experience. The template puts together mobile design practices and a wide selection of tools that make your store suitable all modern mobile devices. Argento is integrated with great functionality to help you increase your mobile conversion. There's no need for an extra mobile template. Argento is a proven strategy for making sales. It is demonstrated by the availability of stylish and functional designs. 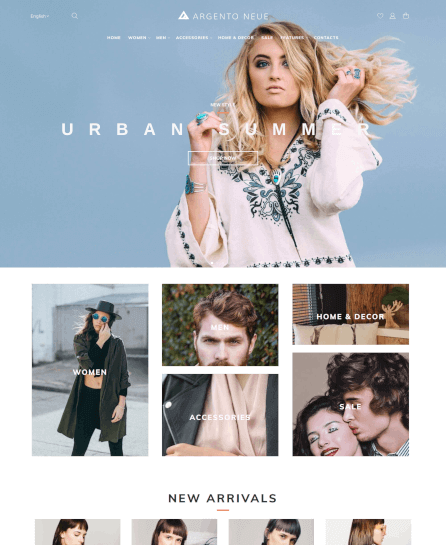 For now, you can use 6 awesome themes developed with the latest web design trends. Each of them brings individualism and uniqueness for your e-commerce store. Choose the best Magento theme for the multi-purpose marketplace with stability in total income. Argento makes SEO work for your website. The template proves the value of SEO by using 7 effective SEO techniques such as HTML and XML sitemaps, cross-links, rich snippets, hreflang tag, metadata templates, canonical urls, SEO urls in catalog filters and pagination. Argento theme is all-in-one Magento SEO solution that brings improvements in traffic, visibility, and conversion. 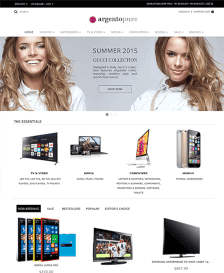 Choose Argento as AMP ready template for Magento. 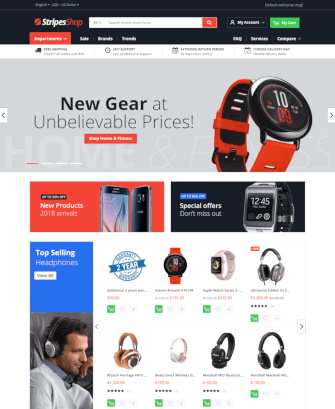 Argento theme supports AMP pages at the homepage, search results, CMS pages, category pages, product, and product comparison pages. It includes AMP module to help you get well designed mobile pages along with full-value functionality to complete a purchase. GDPR compliant. Argento theme is integrated with a Magento GDPR module. That way you bring your site into compliance with EU General Data Protection Regulation requirements. Argento allows users to control their personal data by providing GDPR-friendly checkboxes for giving consent for collecting data. It also includes a “Privacy Tools” page with a request to delete the account. Ajax powered. Being a template with precise ajax settings, Argento makes a shopping process quick and easy for every customer. No more multiple pages reload when adding a product to cart or compare list. With Argento, you get ajax search autocomplete feature, customizable ajax shopping cart, wishlist, and comparison list powered by AJAX. Innovative navigation design. 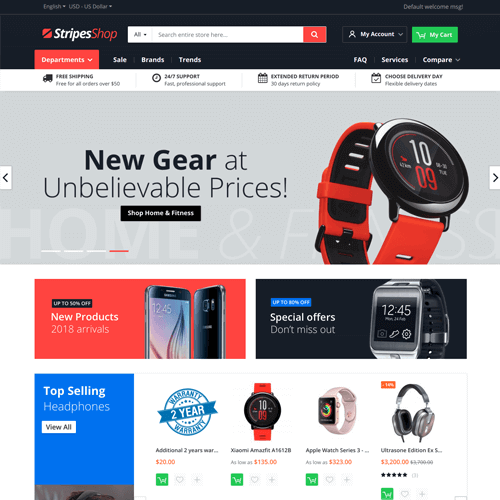 Argento theme is capable of building the intuitive search and navigation all around. Innovative navigation design of the template maximizes usability by using advanced navigation tools. With Argento, you will easily create 16+ professional Magento 2 navigation menus. The template provides good navigation both for desktop and mobile devices. With any Argento license you'll get one month of free outstanding support and free theme installation services. Our support team is top-expert when it comes to making our clients happy. I don't have to write so much words like the other reviewers before. I only have to say three things: 1. Buy it 2. Enjoy it 3. Be amazed about the outstanding support. I tried before some other templates from Themeforest. What a waste of time. Thanks to Template Masters for this wonderful product !